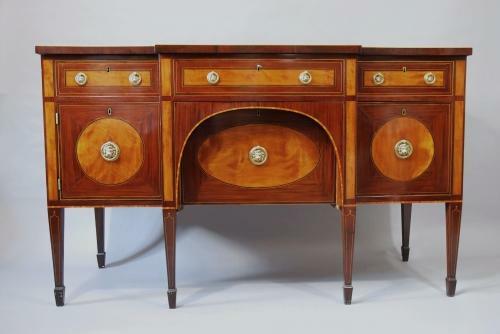 A late 19thc fine quality mahogany & satinwood breakfront sideboard. The top consists of plum pudding mahogany with boxwood stringing around the edge. There are three mahogany lined drawers, with a central satinwood panel, banded with mahogany & boxwood stringing. They each have two brass lion mask handles. The left side has a mahogany cupboard with a central circular satinwood panel with a brass lion mask handle. The right side is replicated but has a cellarette drawer. The central section has a mahogany bottle holder drawer with an oval satinwood panel with a brass lion mask handle. The arch above this is mahogany & tulip wood banded. The sideboard stands on six tapered legs with spade feet.